Hello! Long time no read! How have you been?? Happy to report that we had a wonderful time in Italy and somehow have not suffered from too much jet lag. My #1 tip for beating jet lag is to come back home on a Game of Thrones day! The anticipation will motivate you to stay awake and then the mental drain from the show will knock you right out and you’ll be able to sleep a decent 7 hours! We woke up at like 6am and just got up to eat leftover dumplings and watch TV before getting ready for work, it was actually pretty wonderful lol. I have about a billion photos of Italian cats, sheep, and mortadella sandwiches to go through, but once I do I’ll share all the details of our trip! You know how people say that it takes them a few days into their vacation to fully get off work mode? That has never been a problem for me. It would take me like -3 days to stop caring about work. Revit and coordination emails don’t exist anymore! Well, I definitely didn’t care about work emails while I was away. Don’t worry! But I actually started to get a little antsy about not cooking or developing recipes after a few days. When I couldn’t sleep during the first few nights in Rome, I just laid in bed thinking about all the different dumplings folds I wanted to try or how I would attempt to make a terrazzo cake after seeing all the beautiful terrazzos everywhere! So as much as I loved bopping around Italy with Reuben for 2 weeks, I’m super excited to be back in my kitchen again and make all my favorite foods! I was sort of surprised by what foods I craved and missed the most while I was away. I miss dumplings (ok, that wasn’t that surprising), eggs (couldn’t find one in a scrambled or hardboiled form!!!! ), and cake. All the cafes and bakeries were filled with the most amazing pastries, but after a few mornings of sfogliatella and brioches, I really just wanted a slice of pound cake or a muffin with my cappuccino! I missed the soft and fluffy texture of cake. I got a pistachio plum pound cake on our last day in Rome and it was very disappointing. I was so bummed! There was no plum… and the cake was so dry! Maybe moist cake just isn’t an Italian thing? Thankfully I made these Black Sesame Blueberry Muffins right before we left for our trip so my cake craving was held back by a few days! 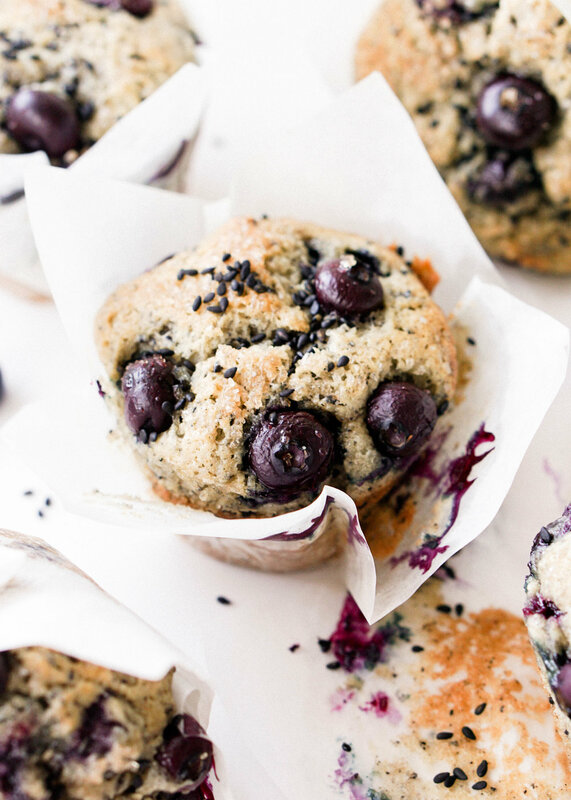 What I love about these muffins is their light but satisfying texture and the fact that they are not too sweet and just let the sweetness of blueberries shine! Plus they are so easy and quick to whip together. Perfect for when you have a million things to do but also need a baked good in your life, which is ALWAYS. You know that my love of black sesame runs deep. The ground up black sesames and tahini add a great nuttiness that balances out the sweet and natural tartness of the blueberries. The muffins are topped with sugar, which adds the most addictive sweet crunch. Can we talk about how moist these muffins are?? The greek yogurt and tahini add a healthy amount of richness and pretty much insures that you won’t have any dry sad muffins! I used Bob’s Red Mill Organic and Unbleached All-Purpose Flour and it works so beautifully in this simple recipe. I think that when you’re baking simple sweets that aren’t hiding under pounds of buttercream or icing, having high quality flour is the key to making sure your star ingredients are front and center. I’ve had probably hundreds of blueberry muffins in my lifetime. They were my muffin of choice at the DAAP (my architecture school) cafe. There have been some great ones and definitely MANY disappointing ones, but these black sesame versions are my new favorite! Preheat oven to 375 degrees. Line muffin tins with parchment liners. 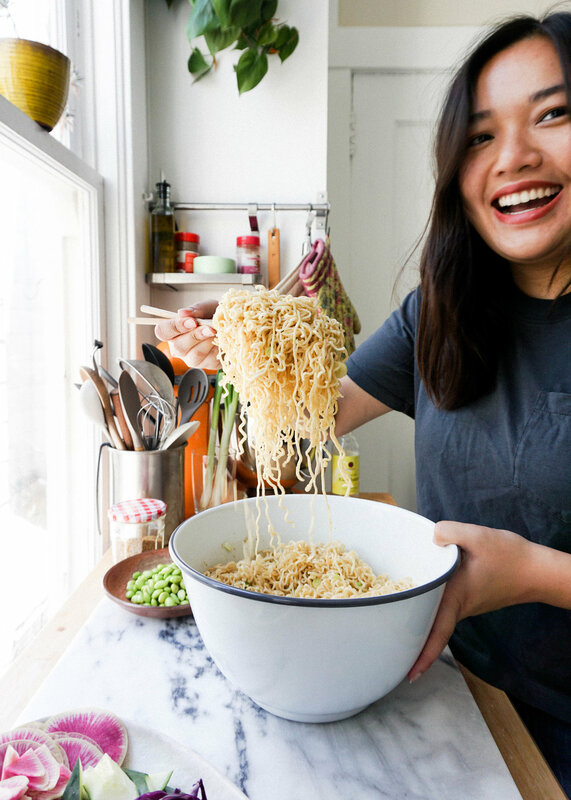 In a large bowl, whisk together flour, baking powder, baking soda, salt, sugar, and finely ground black sesame seeds. In another bowl, whisk together melted butter, eggs, tahini, greek yogurt, water, and vanilla. Add wet ingredients to the dry ingredients and mix until just combined. Toss blueberries in 1 tsp flour. Add blueberries into the batter and gently mix until berries are evenly dispersed. Fill each liner with batter. Since I used tulip baking liners I filled my tins fully. If using regular muffin or cupcake liners fill the tin about 3/4 of the way up. Top each muffin with demerara sugar and black sesame seeds if using. Bake for 28-33 minutes until lightly golden brown and cooked through. Remove from oven and allow muffins to cool in the tin for 5 minutes. After a few minutes remove muffins from the tin and allow to completely cool on a wire rack. Enjoy! Thanks, Bob’s Red Mill for sponsoring this post!